Summerfest is a fine art/fine craft event popular with collectors and visitors (over 50,000). Logan is a university town in a valley of about 100,000 people. 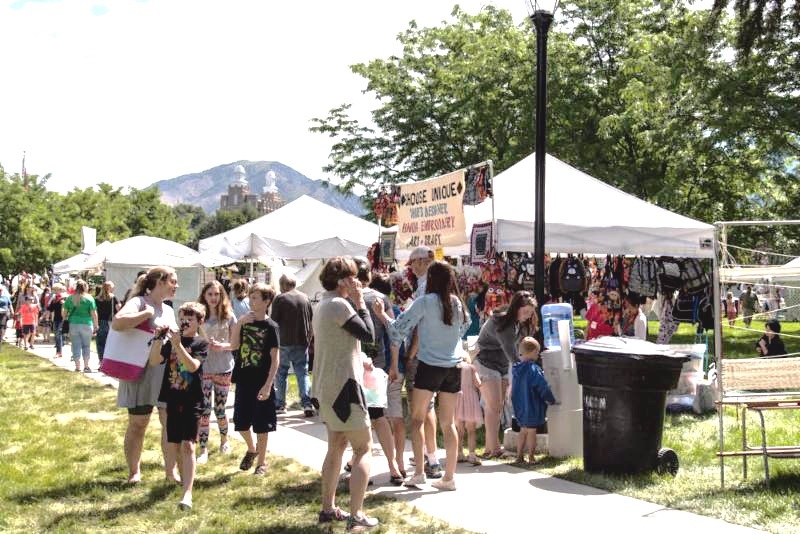 Summerfest Arts Faire is held on the grounds of the historic Mormon Tabernacle in a park-like setting. It is on Main Street in the downtown retail area, so it is highly visible to the passing public. Logan is a strong arts town, with museums, live theatre and opera, galleries, and more. This is a juried event with quality original artwork, outstanding performances, and fun food. We are continually expanding our advertising in order to attract an even larger art-buying public. We advertise on radio, print and digital media throughout all of northern Utah, southeastern Idaho, and southwestern Wyoming, and we are committed to our artists' success. Summerfest is a non-profit corporation intent on elevating our community through exposure to fine art. We hope you will join us this year! A good experience overall for me! My art was very well received and my sales good! Great festival overall, and I was very pleased with how well my "::" art was received in a predominately conservative Mormon community. Best show that I participate in. The committee and volunteers are amazing. Great staff! Great booth sitters! And a great experience! I did far better than I expected. I wish all our shows were run as well as Summerfest.